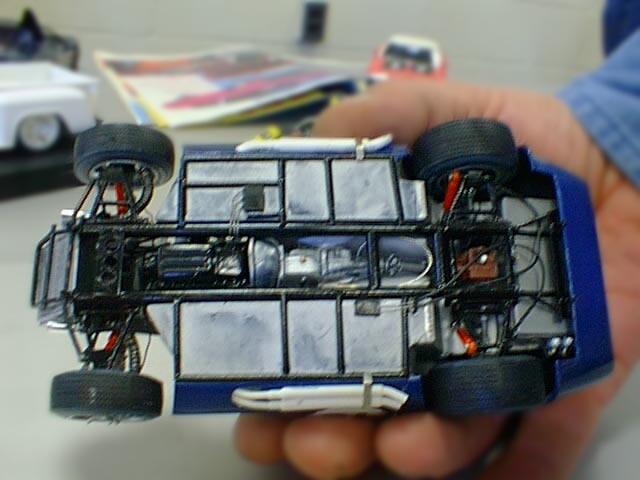 In the lower right corner you can see the twin electric fuel pumps Gordon raided out of an Historic Racing Miniatures GT-40 detailing kit. You can also see the speedometer cable from the transmission's tailshaft. Some have argued with Gordon that race cars didn't use speedometers in those days, but Gordon has painstakingly researched the rules and, sure enough, LeMans did require working speedometers back then.